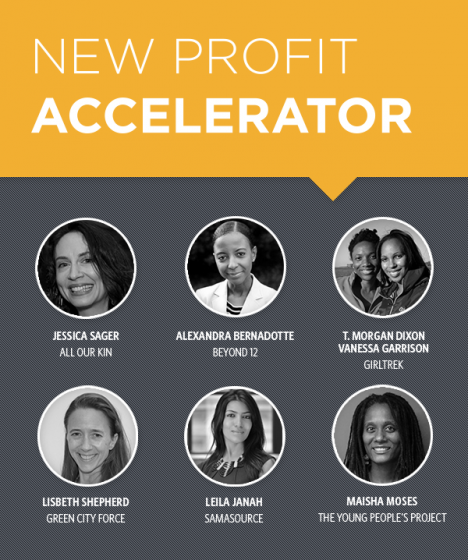 Announcing the New Profit Accelerator Entrepreneurs! Exciting news from New Profit today! I am extremely pleased to announce the launch of the New Profit Accelerator - a new one-year program designed to accelerate the potential of extraordinary female social entrepreneurs and the impact of their organizations. Over the next year, seven female social entrepreneurs will form a cohort and receive insider access to New Profit tools, resources, and networks in addition to a one-time gift of up to $50K. We are grateful to Sarah Peter, one of our visionary New Profit donors, who has funded this program out of a desire to propel more female social entrepreneurs to scale. The donor requested that we at New Profit draw from our existing pipeline and perform due diligence on a variety of outstanding female social entrepreneurs who are closing the opportunity gap in America. Each organization is one that has been on our radar as a potential portfolio organization, and we have been impressed with these women as we have interacted with them at various events, including our annual Gathering of Leaders. Beyond 12 was founded to increase the number of traditionally underserved students who earn a college degree. By integrating personalized coaching with intelligent technology, Beyond 12 bridges the gap between K-12 and higher education to ensure that all students succeed in college. GirlTrek inspires and supports African American women and girls to live their healthiest, most fulfilled lives - simply by walking. Through grassroots organizing and award-winning social media campaigns, GirlTrek supports over 20,000 walkers, 300 volunteers and inspires an ever-growing network of 175,000 supporters. Green City Force is an AmeriCorps program that engages young people from low income backgrounds in national service related to the environment. In doing so, they prepare them for sustainable careers, while reducing green-house gas emissions and building a greener New York City. Samasource delivers enterprise digital services through a unique Microwork™ model that harnesses the untapped potential of the world’s poor. “Sama” means equal. Samasource connects poor women and youth to training and employment in the digital economy. The Young People's Project uses math literacy work to develop the abilities of elementary through high school students to succeed in school and in life, and in doing so involves them in efforts to eliminate institutional obstacles to their success. I'm not sure who said it, but there's a great quote that says "Here's to strong women. May we know them. May we be them. May we raise them." I am thrilled to welcome these seven strong women to the New Profit family.